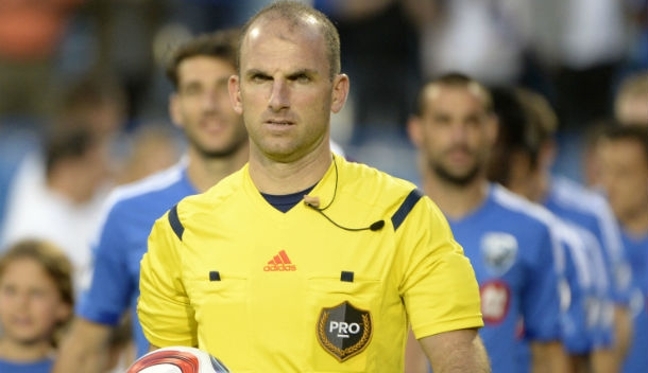 Twelve months on from his switch as a fourth official to a center referee, PRO’s Ted Unkel is settling into life in the middle. The 37-year-old is now a regular on the assignments roster for Major League Soccer, with 29 appearances to his name following his promotion to the role a year ago. His short time with the whistle has brought pleasure and education in equal measure for Unkel, who has endorsed all elements of the position in order to deliver high-quality performances. “A lot has changed in the last year. I’ve got a lot of games under my belt as a referee, and it’s much more comfortable,” he told proreferees.com at a PRO training camp in Park City, Utah. “There’s a good familiarity there now. Whether that’s with the players, the rivalries in MLS or the general matchday experience. It’s been an education that could have only come through time. “When we come up through the ranks we have an ego and an attitude that we are always ready for that next step. But until you get to the next step, you actually have no idea. I’ve learned a lot. Just as aspiring players pile their efforts into emulating their heroes, Unkel admits to doing so with his refereeing idols. A big fan of fellow PRO center Jorge Gonzalez, he has taken parts of his officiating style and implemented them into his own approach to games, and the influence of the staff in general has made his transition to the job a lot smoother. “I’ve been very fortunate this year to have ARs Corey Rockwell, Jeff Muschik and Claudiu Badea who have been around a long time with me who I trust, not only in the games but in life,” he added. “I think we take parts of the job from each other, whether that’s in our pregame approach or being out on the field. I’ve taken similar behavior from Jorge [Gonzalez] with regard to awarding penalty kicks, and giving that little bit more emphasis to the decision. He continues to draw inspiration from his wife Christina, who sits on the FIFA Women’s Refereeing Panel and regularly oversees games in the NWSL. The pair have been on an officiating journey together over the years, and will soon be adding another Unkel to the family, in what will be the next milestone of a memorable year for Ted. “We have another member of the Unkel family on the way. My wife Christina is healthy and doing well.